Pairing type is one of the toughest parts to get right in a web design project, and having tons of custom fonts at our fingertips doesn’t make things any easier. Font selection is more an art than a science. Therefore, reading about typography, individual typefaces and foundries goes hand in hand with lots of practice. However — as Tim Brown says in his guide Combining Typefaces — “practice can take an unreasonable amount of time if you’re not careful” (p.38). In the meantime, the website you are working on makes immediate demands on your budding typography skills. You need to come up with a great solution, and do it quickly. In this article, you’ll find plenty of online resources that will complement your learning about web typography and help you come up with beautiful type combinations. You’ll also learn how some of the services listed below let you test the browser rendering of your chosen fonts and offer hassle-free ways of including them in your project. Browsing websites with good combinations of typefaces is a great way to develop an eye for how typefaces work together and in which contexts they’re being used. Check out the resources below for some great examples. Google Fonts is not just a service for picking custom fonts. It’s also a place where you can learn more about your chosen typeface, including suggestions on a number of typefaces that work well with it. When you select a typeface on Google Fonts, click on the small Pop out button to the bottom right of the font’s container box. Next, click on the Pairings tab and you’ll see examples of how your selection is paired on the web with other typefaces. Although I like this resource, in my view it doesn’t say much about the context in which the suggested pairings are used. For instance, what kind of websites use Open Sans and Roboto together? Are they text-heavy websites like news sites and blogs? Are they image-focused websites like a photography portfolio site? Which page elements use Open Sans and which ones use Roboto? This is super helpful information when it comes to selecting type combinations, and in order to find it we have to look elsewhere. Beautiful Web Type showcases a selection of typefaces from Google Fonts. The examples are a bit generic – they’re not taken from real websites with specific goals and strategies. That said, the website shows off its typeface selections in beautifully designed sections. Notice how text hierarchy, font weights and styles, all play a part in making the text more readable and conveying the appropriate mood. Another inspirational collection of typeface combinations from Google Fonts is on the Google Web Fonts Typography Project website. Typ.io gives you tons of information on trendy typography designs and an up-to-date range of websites with well paired typefaces. Not only will you see matching typefaces, but you will also get a sense of the role type plays in the design of real websites – which typeface is used for headings, which one for body copy, the font selection the designer has made for a certain kind of website, e.g., portfolio, blog, marketing, etc. Finally, click on the image with your favorite typeface combination, and you’ll get the CSS code and the links to the services where you can purchase or download the font files. Fonts in Use is another popular resource offering a wide collection of typefaces that work well together, taken from real websites. To stress the point, showing how type works on websites from a variety of industries and contexts is crucial to developing an eye for good typesetting decisions. The resources I’m going to list below will ask for your input in the search for the perfect type combination. Be it a way of testing typefaces or simply making a selection and waiting for a number of suitable matches, these tools are interactive and fun to use. The beauty of Typespiration is that it lets you browse different designs showcasing beautiful free fonts and color palettes. Preview a close-up of the design. If you click the Baseline grid button on the top right you can also check how the text sits on the baseline grid. Learn about the fonts and colors used in the design. Copy and paste the HTML and CSS code you need to recreate the design in your project. Sans serif/serif: The title will use a sans serif typeface, body copy a serif one. Serif letterforms have small flourishes on the end of each character, sans serif ones don’t. Serif/sans serif: Serif for the title, sans serif for the body copy. Sans serif/sans serif: Sans serif typefaces for both title and body copy. Cursive/sans serif: Cursive for the title, sans serif for the body copy. Cursive typefaces have a handwriting style, which suits titles and logos but is best avoided for body copy. Cursive/serif: Cursive for the title, serif for body copy. Serif/serif: Serif typefaces for both title and body copy. Type Genius is a smart service that lets you find great matches for your chosen typeface. Suggested pairings using your selected typeface. Links to the websites using the suggested pairings. Editable title and body text to experiment with your choice of typeface. Links to the service where you can download the font files. Font Combinator is a powerful online tool, great for browsing matching combinations of typefaces designed by Typotheque, a type foundry and design studio in the Netherlands. You can choose typefaces from the Latin, Greek and Cyrillic character sets. A select box lets you browse font pairings using various keywords such as Elegant, Classic, Trendy, etc. You can fully edit the text on display, adjust the styles of the selected typeface, and drag any typeface listed to the right of the page on to the display area for testing. Adobe Typekit Combos by Fontdata is a nifty tool, still in beta, that lets you select a Typekit font and finds matching fonts for you. Once you make your selection and click the View button, this tool displays a list of suggested matching Webkit fonts and a link to a number of websites where you can see those fonts on display. The tools I’m going to list below are not only good for making great suggestions about typefaces that work well together. They also, and most importantly, give you bite-sized chunks of knowledge about type and how to match typefaces. This is a favorite of mine. Type Connection by Aura Seltzer calls itself a Typographic dating game. It’s a highly interactive tool in the form of a dating game for finding great type pairings and learning about typography. Type Connection starts with well-known typefaces looking for the right match. You’re the matchmaker who’s going to find the ideal partner using one of the strategies for combining typefaces. At each step of the way, you’ll learn something about the meaning of typographic terms,history of type, etc. Once the game is over, you’ll find out the reason why the match does or doesn’t work. Don’t stop at the game, though. The Type Connection website is a treasure trove of typographic nuggets, including a summary of typeface combination strategies and tons of links to a variety of references about typography. Mixing Typefaces is a PDF copy of a page taken from U&lc (Upper and lower case), a historic publication targeting the design community. The Art of Mixing Typefaces is a great infographic about combining Google Fonts created byFastPrint, which takes inspiration from the U&lc document I listed above. The information is conveyed using colors rather than numbers, but it works pretty much the same way. The Art of Combining Fonts is a fantastic infographic for learning a thing or two about type pairing … ah, it’s also fun to read. Mixing and Matching Fonts is another beautiful infographic with some mini typography lessons baked in by Fontaholic. This infographic by DesignMantic includes both examples of typeface combinations and excellent advice about typography. Before purchasing or downloading a font, it’s a good idea to test how it renders in the browser at different screen resolutions. The online resources below do a good job at letting you preview your chosen fonts. Some of them will also help you include the fonts in your project. With a bit more digging, you’ll find that Google Fonts has a few additional options for previewing and testing your font selections. 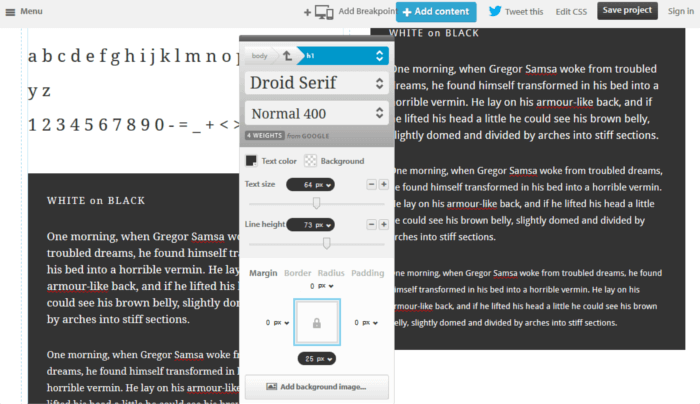 I’ve added Droid Sans and Droid Serif to my collection for testing. Selecting from a type family with sans serif and serif variations is one of the safest bets when you’re just starting out. Remove an individual font by clicking on the x icon next to it. Remove all selected fonts by clicking on the Remove all families from Collection button. Test your selections in a variety of interactive ways by clicking on the Review button at the bottom of the screen. Once you’re on the Review screen, click on the Test Drive tab to put your selection to its paces. From this screen you can test your typefaces for body text, headings and sub-headings, change font size, line height and other CSS properties, replace the existing content with your own, and more. 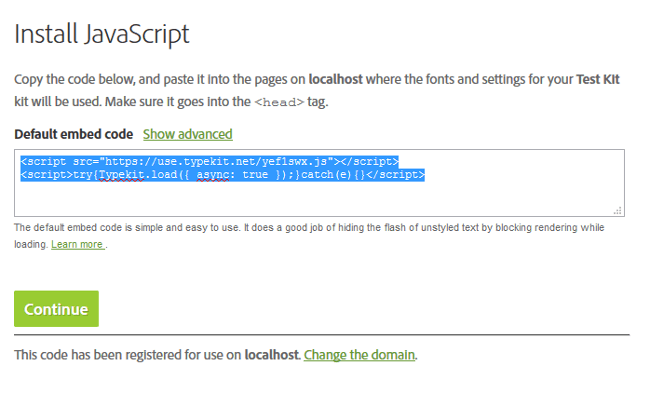 If this weren’t enough, you can test your selection further on Typecast by clicking the Try in Typecast option on the Review screen of the Google Fonts website. This will land you on the Typecast app, which I’m going to cover in the next section. Once you’re happy with your selection, you can painlessly include the fonts in your project using Google CDN (Content Delivery Network). Start by clicking on the Use button at the bottom of the screen. From here you can fine tune your selection by picking the font styles and character sets you need. Stick to what you really need – the more styles and character sets you add the longer it takes for the files to load in the browser. Best of all, you can simply grab the code Google Fonts provides and paste it in your project, then let the service stream the fonts to your website. 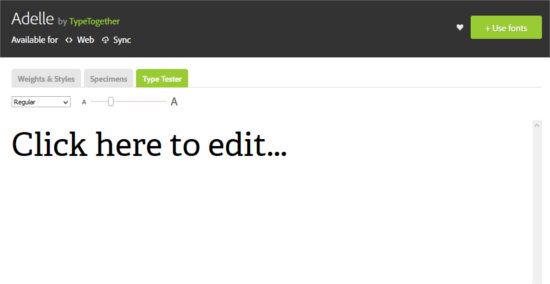 Typecast offers an interactive canvas to design working prototypes. By creating a free account you can then export all the necessary HTML and CSS code for easy inclusion in your project. Adding your own text content. Adjusting tons of CSS values like background color, color, font size, line height, etc. Previewing your typefaces at different viewport sizes. Checking how your text behaves on a baseline grid. Web Font Blender is not as feature-rich as Typecast, but it’s got all you need to quickly mix and match typefaces from the Google Fonts library, edit the existing text, adjust CSS font values, and grab the code for a seamless integration with your project. Like Google Fonts, Typekit by Adobe lets you preview an impressive number of fonts and takes care of streaming your chosen fonts to your website for easy inclusion. No need for you to license each individual font. Unlike Google Fonts, Typekit is a subscription-based service offering different pricing plans. 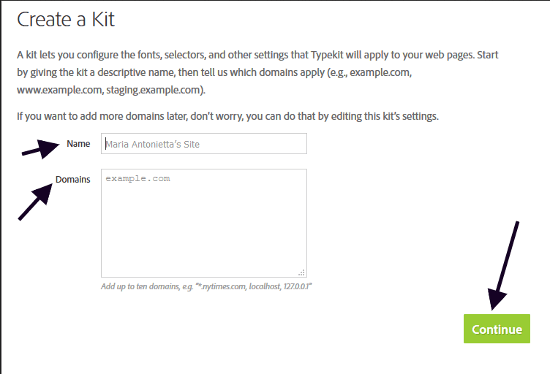 You can give Typekit a try using the free subscription plan, which lets you choose from 940+ fonts for your website. You have a number of options for browsing fonts, including recommendations for headings and paragraphs, languages, type families, and more. When you’re ready to preview a typeface, click on it. On the new screen you’ll be able to inspect its various weights and styles and to learn more about the font family and the foundry that created it. 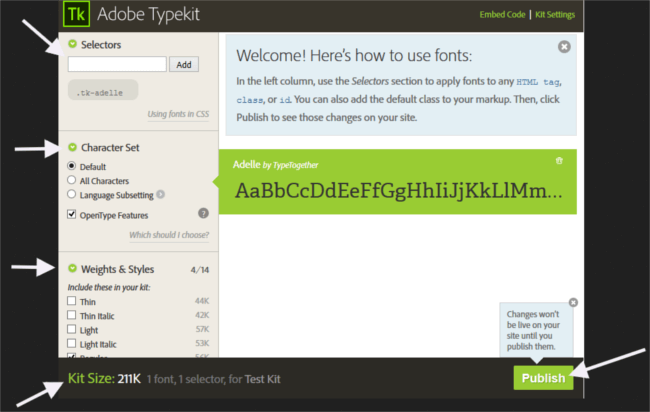 Typekit uses kits as a way of including fonts in a web project. Here’s a short tutorial on how to create a kit. For a detailed one, head over to the Typekit help page. 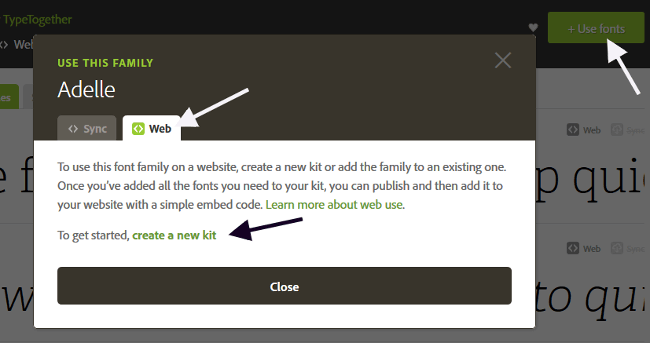 Start by clicking on the create a new kit link that you see in the image above. Next, a popup screen asks you to enter a name for your kit and your website’s domain. Go ahead and do so, then click on the Continue button. Cool, you’ve just created a kit! To use the kit in your project, simply copy and paste the code Typekit gives you inside the <head>section of your HTML document. Then click the Continue button to access the next screen. The final step is to select the font’s character set, weights and styles. Keep an eye on the kit size information at the bottom of the popup window – the more character sets, weights and styles, the more weight you’ll be adding to your web page. If you want Typekit to take care of styling your typographic elements, enter the relevant CSS selectors in the input box at the top of the page. Alternatively, you can simply add the relevant CSS rules to your website’s stylesheet. When you’re done, go ahead and click Publish. Your website should display your chosen typefaces within minutes. Loved this article? Boost your skills with these fun typography games. This article was originally written by Maria Antonietta Perna for Sitepoint.